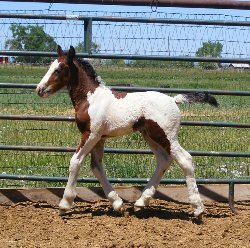 Romeo - Bay Tobiano APHA colt out of Unaweep Reynolds Wrap, by Rugged N Classy. Born August 14, 2016. ES Tarragon - aka 'Manny'. 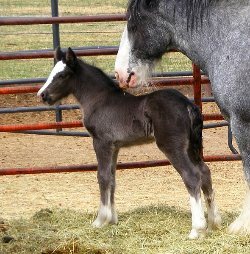 Black and white colt out of The Spice Tree Mare, by ES Gandalf The Grey. Born July 21, 2016. 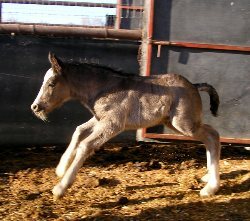 ES Daenerys - Grey filly out of Strawberry Delight, by Rainbow's Blue Genes. Born May 31, 2016. 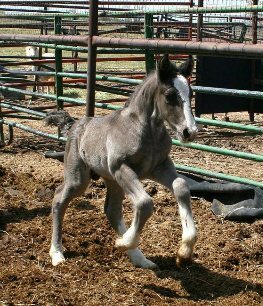 ES Dear Prudence - Black and white filly out of Sweet Potato, by RGR Scout. Born May 17, 2016 at 8:30am. ES Coriander - aka 'Ander'. 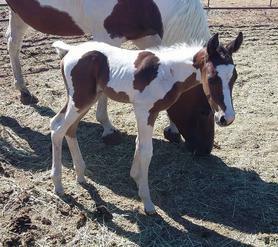 Bay tobiano colt out of The Spice Tree Mare, by Rock. Born July 26, 2015 at 3:00pm. ES Irish Heartbreaker - aka 'Brody'. 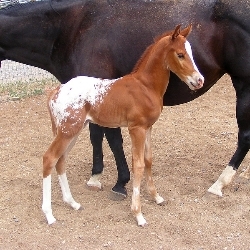 Black and white colt out of Strawberry Delight, by Luck of the Irish. Born June 13, 2015. 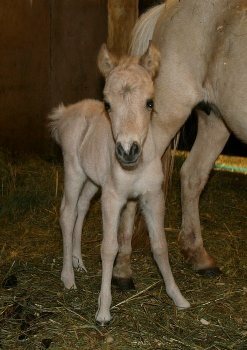 Gita - 2015 Buckskin Miniature filly out of Puff. Born May 10, 2015. ES Lorcan - Black Blagdon Gypsy colt out of Beibhinn Blue, by Silver Fox. Born April 10, 2015. 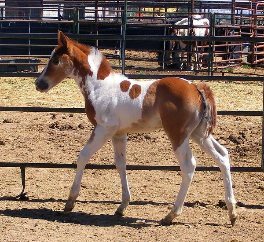 Rosalind - Chestnut tobiano APHA filly out of Unaweeps Renolds Wrap, by Rugged N Classy. Born April 22, 2014. 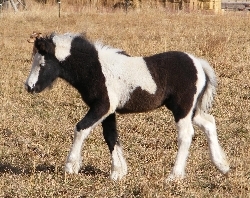 ES Edelweiss - Black Tobiano Gypsy filly out of ES The Sage Filly, by Luck of the Irish. Born early morning on June 9, 2016. 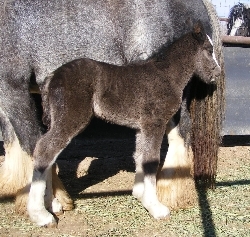 ES Aine - Black Blagdon 3/4 Gypsy Filly out of ES Zelda, by ES Gandalf The Grey. Born May 29, 2014 at 11:20pm. 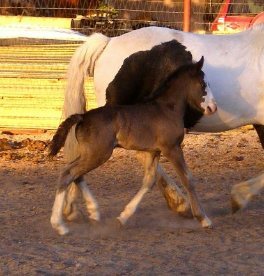 ES Rue - Black Tovero Gypsy Colt our of The Spice Tree Mare, by ES Gandalf The Grey. Born April 13, 2013 at 5:40 am. ES Tuilelaith - Black Blagdon filly out of Beibhinn Blue, by Silver Fox! Born late morning on March 21, 2013. 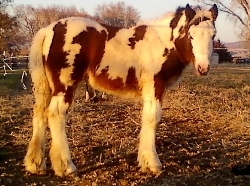 "Duncan" - Bay Tobiano APHA colt out of Dun D Light, by Rugged N Classy. Born May 29, 2012, just after midnight. 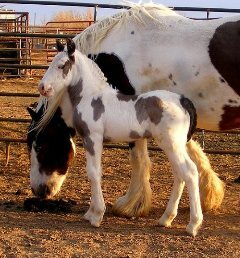 ES Juniper Berry - Grey APPY Spotted Tobiano Filly out of The Spice Tree Mare, by Rainbow's Blue Genes. Half sister to Basil, Sage, Bobby, and Copycat. Born May 7, 2012, at 7am. ES Eibhleann - Black Blagdon Filly out of Beibhinn Blue, by Luck of the Irish. Sister to ES Artair, ES Dubhghall, and ES Perfect Patience. Born April 10, 2012, at 8:30am. 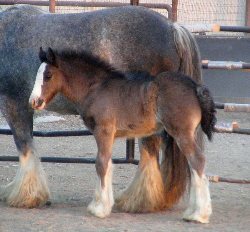 Bay Tobiano Gypsy Horse Colt out of The Spice Tree Mare (Kizzie), by ES Gandalf The Grey. 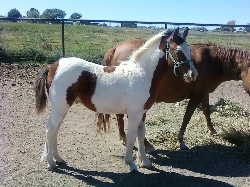 Full brother to ES Cayenne Pepper (RIP) and ES The Sage Filly (Keeper). Born June 11, 2011. 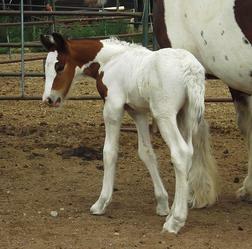 Ezekiel aka "Zeke" - Bay Friesian Sport horse colt out of Lady Arwen Spanish Mustang/Arabian), by Keevo (Friesian). Born June 6, 2011. ES Artair aka Arty - Black Blagdon colt out of Beibhinn Blue, by Luck of the Irish. Full brother to ES Dubhghall and ES Perfect Patience. 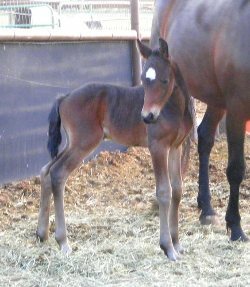 Born April 17, 2011. Ziggy's Black Diamond aka Little B.D. 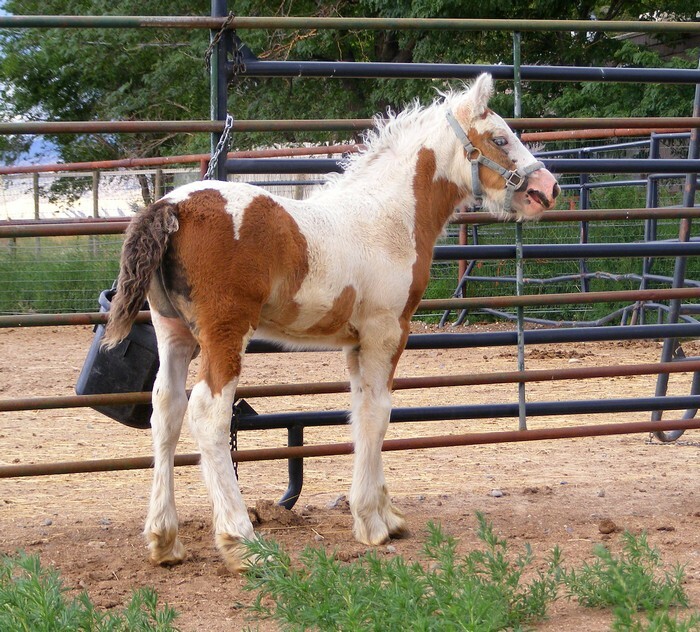 - Black Gypsy Cross colt, out of Bebe (Spanish Mustang), by Luck of the Irish. 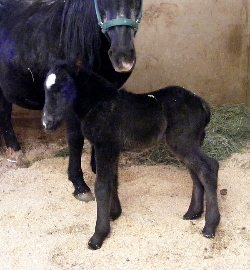 Born Feb. 3, 2011. 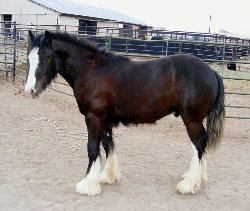 ES Dubhghall - 2010 Black Blagdon Colt by Luck of the Irish, out of Beibhinn Blue. Born April 30, 2010. 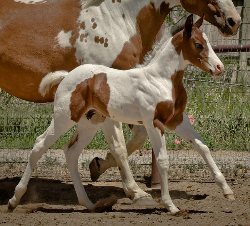 ES Cayenne Pepper - 2009 Bay Tobiano filly out of The Spice Tree Mare by ES Gandalf The Grey. Aug. 3, 2009 - Dec. 30, 2009. Rest in Peace sweet filly. 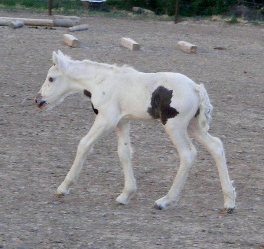 Jasper - 2009 Appaloosa Colt. Out of CLASSYNOSPOTS, by the stallion, What A Peach. Born June 26, 2009. 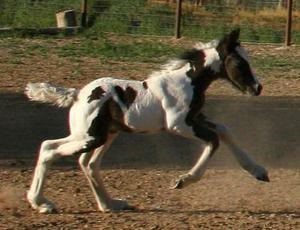 Ziggy's Marley - Dun Tobiano Gypsy Cross colt, by Luck of the Irish, out of La Luna Bella. Born May 12, 2009. 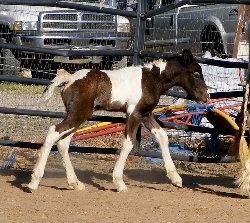 Isabelle - Black Tobiano Paint Filly, by Two Eyed Ying Yang, out of Jen (grade Quarter Horse). Born May 10, 2009. 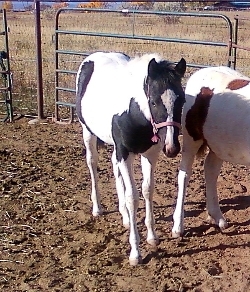 ES Its About Thyme - 2008 Black Homozygous Tobiano Filly by Luck of the Irish, out of The Spice Tree Mare. Born Sept 16, 2008. Page updated on April 26, 2017.